West Windsor, N.J. - The Gallery at Mercer County Community College rings in 2012 with "Surface Tension: Works by Ayami Aoyama and Florence Moonan." The show will run Wednesday, Jan. 11 through Thursday, Feb. 9. A reception with the artists will be held Wednesday, Jan. 18, 5 - 7:30 p.m., and a Gallery Talk will feature the artists on Wednesday, Feb. 1, starting at 7 p.m. All events are free and open to the public. The Gallery at MCCC is located on the second floor of the Communication Building on Mercer's West Windsor campus, 1200 Old Trenton Road. According to Gallery Curator/Director Tricia Fagan, "In creating their art, Aoyama, a sculptor, and Moonan, a painter, explore 'surface' not only as a noun - that flat plane on which they make their marks - but also as a verb. Each artist in her own way coaxes, cajoles and teases her medium to allow secrets that lie beneath the first impression to surface, allowing viewers to catch a glimpse." Together, Aoyama and Moonan present a show of dynamic yet quiet beauty. For Moonan, what often reveals itself is the actual archaeology of the painting itself. She says, "I'm interested in scraping through the painted surface to uncover buried marks that create a history of where I've been." Aoyama's sculpting process is almost the mirror opposite. She sees sculpting as an intimate conversation between herself and the stone, adhering to the Shinto proverb that "eight million gods dwell in everything." In her carvings, she works to uncover the spirit or intrinsic beauty of each stone. Gallery hours for the spring semester are: Tuesdays, 11 a.m. - 3 p.m.; Wednesdays, 9 a.m. - 3 p.m. and 6 - 8 p.m.; and Thursdays, 11 a.m. - 3 p.m. and 3:30 - 5:30 p.m. For more information, call the Gallery at 609-570-3589, visit the Gallery webpage here, or email gallery@mccc.edu. Read the artists' bios here. 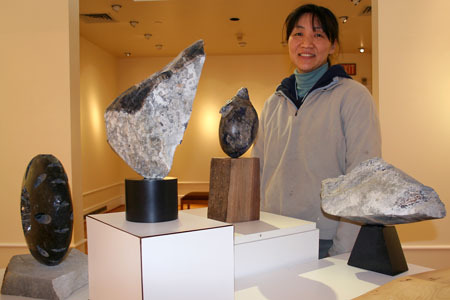 Ayami Aoyama with some of her sculptures included in "Surface Tension" at the MCCC Gallery. 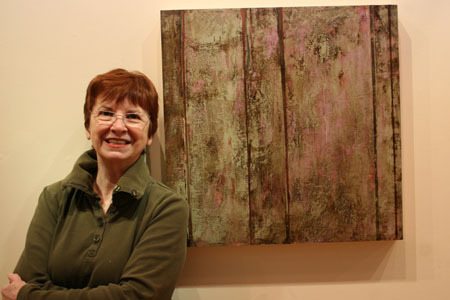 "Purple Chamber" is among the 20 paintings by Florence Moonan selected for the show.